Offer condition: All pick ups until 15th December 2015. Do not miss another Holiday Autos voucher! Simply leave your e-mail address and we'll always keep you informed of new vouchers for Holiday Autos. Offer condition: 20% discount off the car rental cost of selected car hire bookings made between 11-17 June 2012 inclusive for rentals until 14th July 2012. As part of the promotion, all pick up locations at the following countries will be eligible for a discount using a promo code. The discount is varied and will depend on the country pick up location being booked. The code must be entered and applied in section 6 of the booking details page in order to redeem the offer. Please note that this code may not be valid for selected car types and you will be informed on section 6 of the booking page. Offer condition: The promotional code will apply a 11% discount off the car rental cost for worldwide bookings made between 00.00 on Wednesday 5 June until 23.59 on Sunday 16 June 2013; Applicable for rentals picking between 5 and 30 June of April 2013. The code must be entered and applied in section 6 of the booking details page in order to redeem the discount. Please note that this code might not be valid for selected car types and you will be informed on section 6 of the booking page. Offer condition: Pick-up period: by 14 July 2013. Minimum rental duration: 3 days. £15 discount off the car rental cost for all bookings to Austria, Belgium, Bosnia and Herzegovina, Bulgaria, Croatia, Cyprus, Czech Republic, Denmark, Estonia, Finland, France, Germany, Greece, Holland, Hungary, Iceland, Ireland, Italy (excludes Sicily and Sardinia), Latvia, Lithuania, Luxembourg, Malta, Montenegro, Norway, Poland, Portugal (includes Madeira and Azores), Romania, Serbia, Slovakia, Slovenia, Spain (includes Balearics and Canaries), Switzerland, Turkey, Ukraine, United kingdom made between 15 June and 16 June 2013; Applicable for rentals picking up until 14 July 2013. A minimum 3 consecutive day rental period applies. The code must be entered and applied in section 6 of the booking details page in order to redeem the discount. Please note that this code may not be valid for selected car types and you will be informed on section 6 of the booking page, once you have applied the code. This is a limited offer and this subject to availability. All bookings which require confirmation within 48 hours will still be eligible for the £15 discount providing the original booking is confirmed with our supplier. If we are unable to confirm your original booking within 48 hours you may still be eligible for the discount providing you re-book your car hire with Holiday Autos within 48 hours of being notified that your original booking cannot be confirmed. This offer cannot be used in conjunction with any other offer and will not apply to any pre-bookable extras such as Cancellation Waiver Protection, our Damage Excess Waiver products, our Max and GPS products. Lowest prices may vary according to pick-up location, date availability. The promotional code applies to all new bookings made within the promotion date specified and cannot be applied to existing bookings or applied retrospectively. The Holiday Autos standard terms and conditions apply. Prices are applicable to UK residents only and may be subject to change without notice. Offer condition: Valid for countries: Germany, France, Italy, Portugal, Cyprus. Pick-up period: 1 Jun – 30 Jun 2013. Minimum day rental: 3 day rentals. Offer condition: Pick-up period: 29 May – 30 Jun 2013. Offer condition: Valid for countries: Germany, France, Italy, Portugal, Cyprus.Pick-up period: 25 May – 31 May 2013. Minimum day rental: 3 day rentals. Offer condition: Pick-up period:13th May – 15th July. Please note that this code may not be valid for selected car types and you will be informed on section 6 of the booking page, once you have applied the code. This is a limited offer and this subject to availability. All bookings which require confirmation within 48 hours will still be eligible for the 12% discount providing the original booking is confirmed with our supplier. If they are unable to confirm your original booking within 48 hours you may still be eligible for the discount providing you re-book your car hire with Holiday Autos within 48 hours of being notified that your original booking cannot be confirmed. This offer cannot be used in conjunction with any other offer and will not apply to any pre-bookable extras such as Cancellation Waiver Protection, our Damage Excess Waiver products, our Max and GPS products. The promotional code applies to all new bookings made within the promotion date specified and cannot be applied to existing bookings or applied retrospectively. Lowest prices may vary according to pick-up location, date availability. The Holiday Autos standard terms and conditions apply. Prices are applicable to UK residents only and may be subject to change without notice. Offer condition: New Zealand, Australia, Dominican republic, Jamaica, Malaysia, Puerto Rico, Singapore, St Lucia & South Africa - only.Pick-up period:18-30 April.Minimum rental duration:3 days.Please note that this code may not be valid for selected car types and you will be informed on section 6 of the booking page, once you have applied the code. This is a limited offer and this subject to availability. All bookings which require confirmation within 48 hours will still be eligible for the 10% discount providing the original booking is confirmed with our supplier. If we are unable to confirm your original booking within 48 hours you may still be eligible for the discount providing you re-book your car hire with Holiday Autos within 48 hours of being notified that your original booking cannot be confirmed. This offer cannot be used in conjunction with any other offer and will not apply to any pre-bookable extras such as Cancellation Waiver Protection, our Damage Excess Waiver products, our Max and GPS products. The promotional code applies to all new bookings made within the promotion date specified and cannot be applied to existing bookings or applied retrospectively. Lowest prices may vary according to pick-up location, date availability. The Holiday Autos standard terms and conditions apply. Prices are applicable to UK residents only and may be subject to change without notice. Offer condition: Austria, Belgium, Bosnia, Bulgaria, Cyprus, Estonia, Germany, Greece, Holland, Hungary, Ireland, Italy, Malta, Latvia, Luxemburg, Poland, Portugal, Serbia, Slovakia, Slovenia, Turkey, Ukraine, UK - only. Pick-up period:18-30 April. Please note that this code may not be valid for selected car types and you will be informed on section 6 of the booking page, once you have applied the code. This is a limited offer and this subject to availability. All bookings which require confirmation within 48 hours will still be eligible for the 10% discount providing the original booking is confirmed with our supplier. If we are unable to confirm your original booking within 48 hours you may still be eligible for the discount providing you re-book your car hire with Holiday Autos within 48 hours of being notified that your original booking cannot be confirmed. This offer cannot be used in conjunction with any other offer and will not apply to any pre-bookable extras such as Cancellation Waiver Protection, our Damage Excess Waiver products, our Max and GPS products. The promotional code applies to all new bookings made within the promotion date specified and cannot be applied to existing bookings or applied retrospectively. Lowest prices may vary according to pick-up location, date availability. The Holiday Autos standard terms and conditions apply. Prices are applicable to UK residents only and may be subject to change without notice. Offer condition: The Promotional Codes will only be available to use in selected locations, on selected cars and for a specific period of time. The Promotional Code can only be used for selected car rental bookings made during the Promotional Period for pick-ups between 00.00am on 8th April 2013 until 11.59pm on 30th June 2013 inclusive. The Promotional Code must be entered and applied in section 6 of the booking details page in order to redeem the discount. The Promotional Codes will not be valid for selected cars, van, prestige or motorhome hire bookings and you will be informed on section 6 of the booking page, once you have applied the Promotional Code if it is not eligible to be used. The Promotional Code cannot be used in conjunction with any other offers and may not be redeemed for cash or exchanged. The Promotional Code will apply a 15% discount to the standard online rates available on the sale day for the specified sale destination(s) and once the Promotional code applied has been applied, the car price will be reduced by 15% Please note that online prices may fluctuate during the sale period). Prices change quickly based on demand and availability and during the sale, the cheapest cars will book up first. They work with multiple suppliers to offer you a wide range of cars at great prices to give you the best possible choice.Any quotes will only be valid on the date the quotation is made and cannot be honoured after the sale offer has expired for that destination. Only one Promotional Code can be used per booking transaction and it is to be applied to the booking transaction as a whole not per customer however there is no maximum to the number of bookings you can make during Promotional Period. The Promotional code is only valid to be used on all new bookings made to the sale destination on the specified date with the relevant Promotional code shown in the 24 hour sale period advertised and cannot be applied to existing bookings or applied retrospectively. Use of the Promotional Code will give you 15% discount off the cost of your booked car rental and is inclusive of Airport surcharges, collision damage waiver (cdw), environmental tax, supplementary liability insurance, theft waiver, third party liability insurance, theft protection (tp), unlimited mileage (except Australia) and loss damage waiver (ldw). The discount will not apply to any pre-bookable extras such as Cancellation Waiver Protection, our Damage Excess Waiver products, our Max and GPS products. All bookings which require confirmation within 48 hours will still be eligible to use the Promotional Code providing the Promotional Code was applied during the original booking and the booking is confirmed with our supplier. If we are unable to confirm your original booking within 48 hours you may still be eligible for the discount providing you re-book your car hire with Holiday Autos within 48 hours of being notified that your original booking cannot be confirmed. Once a confirmed booking has been made, it will be possible to make minor changes to your bookings such as adding the names of new drivers or adding pre-bookable extras. Any major changes such as cancellation, changing the time, date and location of the pick-up and drop off or changing the car group booked, for example, will be possible but may result in the discount being removed and you will also be responsible for any additional charges which may apply as a result of these changes. 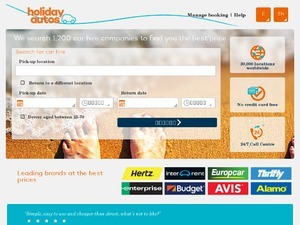 If you wish to cancel your car hire booking at any time, the normal Holiday Autos cancellation policy and charges will apply. The Holiday Autos standard terms and conditions apply as well as any terms and conditions of the relevant supplier. Promotional Code may only be used by UK residents. The promoter reserves the right to withdraw or vary the Promotional Codes and/or these terms and conditions at any time. Latest voucher code valid at a time of promo publication was entered to be working from 2015-07-28.